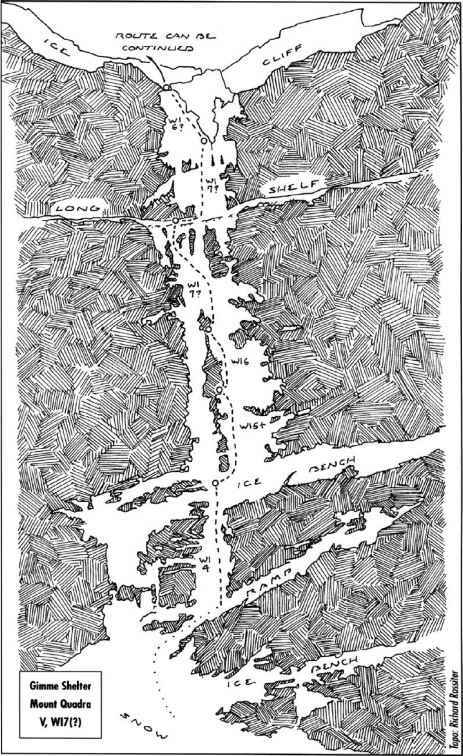 In January 1983 1 made the long ski approach to camp below this singular route. My partner was Alex Lowe, a climber from Montana who was little known at that time, though he was one of the best ice climbers and all-around American mountaineers. 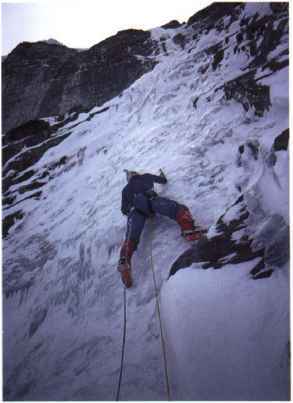 He has since become famous for guiding Everest several times and authoring numerous extreme new routes on rock and ice. On our attempt, Alex and 1 disagreed as to the relative security and wisdom of climbing under the séracs of Quadra's hanging glacier. In the end we retreated, after several pitches of excellent, bold thin ice. This was not due to the difficulty of the climbing, but rather to my uneasiness with the seracs. In April of that same year, Kevin Doyle and Tim Friesen, a couple of the best Canadian climbers, made the first ascent. However, they stopped at the top of the water ice, leaving the upper seracs to the hanging glacier unclimbed. 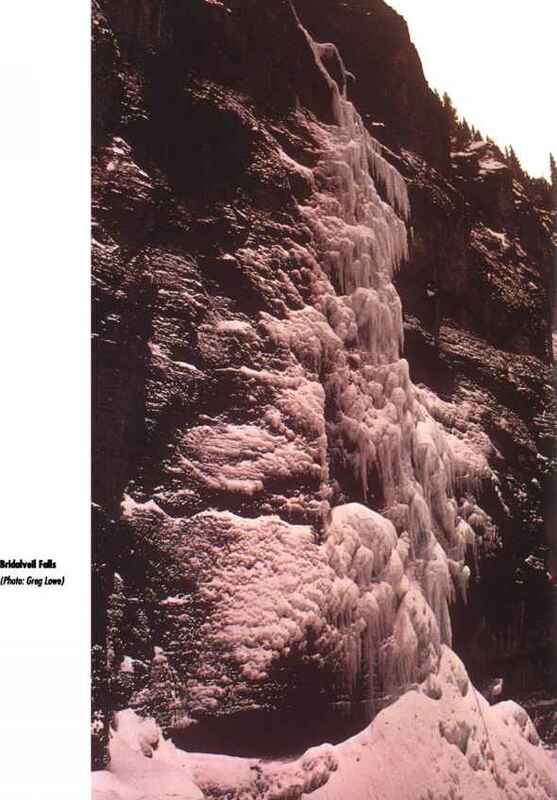 Then in 1992, a parallel line formed to the right of Gimme Shelter, Called Arctic Dream, it was climbed by Joe Josephson and Joe McKay, who also stopped below the seracs. Finally, in April of 1992, the Québécois climber Serge Angellucci and Frenchman François Damilano completed Arctic Dream (grade V, Wl6) through the ice cliff to the hanging glacier, making, in my mind, the first full ascent. Gimme Shelter is the more impressive of the two lines, however, and the ultimate climb would be to ascend Gimme Shelter and the ice cliff above to the hanging glacier, then finish on one of the little couloirs leading to the actual summit of Mount Quadra above the glacier shelf. This would yield an incredibly varied grade VI route with about 3,000 feet of elevation gain, combining thin waterfall ice difficulties with an alpine ice cruise. To date even the original pitches of Gimme Shelter have not had a second ascent. Season: November through April, depending on the particular season Comments: Without question the ice cliffs and seracs of Quadra's hanging glacier present a real objective hazard on this climb. If you decide to take the risk, prepare yourself mentally to move quickly. It should be possible for a fast party of two to do the climb in 6 or 8 hours, which would be far preferable to making a bivouac on the route. If you are climbing this well, it should also be possible to continue through the ice cliff in two or three pitches and solo up the couloir to the peak in another 3 or 4 hours. This would be one of North America's finest days on ice. Approach: From Lake Louise follow the road toward Moraine Lake, which, in winter, is gated after a very short distance. From here ski to Moraine Lake and continue south to Consolation Valley, a total distance of about 15 miles that requires 5 or 6 hours. Make a camp here and prepare for an early start. Route: An introductory pitch (Wl4) climbs from the top of the snowfield below the face to a snow ledge at the bottom of the main falls. From here six or seven pitches follow the line of thickest ice to the bowl at the bottom of the ice cliffs. All of these pitches will be Wl5, 6, or possibly 7, with very sparse protection. Descent: If you climb only the original route, rappel from pitons and V-threads back down the climb. If you continue to the hanging glacier, or even the summit, you have the option of walking east on the glacial shelf and descending the large snow couloir that borders the left side of the North Face.